Today I would like to step back and take a longer-term perspective on where gold is likely headed in 2018. 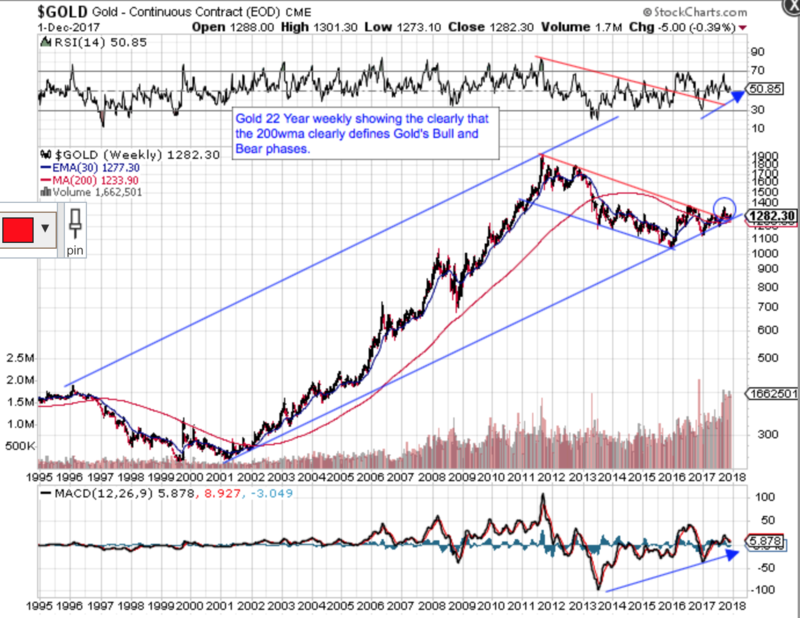 My first chart is a 20+ year weekly showing that gold is at a major inflection point in my long-term uptrend channel. It shows a massive 20+ year Bull Flag that is either going to continue its breakout above the 2011 down trend or this will be a false breakout and my uptrend channel will fail. 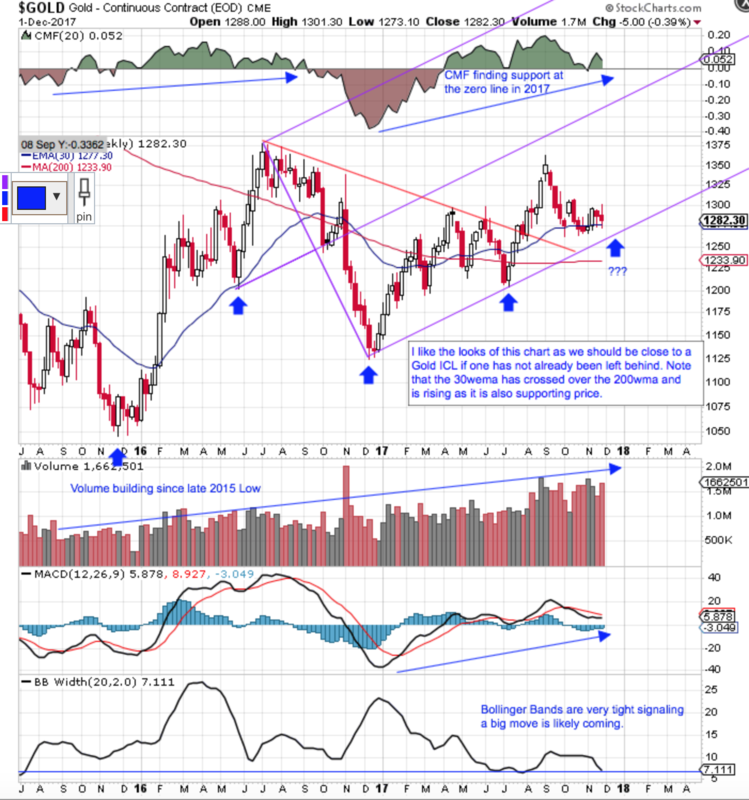 My second chart shows you that gold has found a Yearly Cycle Low (YCL) in the Nov/Dec timeframe for the past 4 years. My Cycle work indicates that gold’ 5-6 month Intermediate Cycle Low (ICL) should be very close, if it has not already been left behind. So once again, Nov/Dec seems to be lining up for a major low (ICL/YCL), from where we should see another strong rally. Will this be a strong Elliott Wave 3 rally I have been looking for? Time will tell. My next two charts are close up Daily charts of gold and GDX. Throughout 2017, gold has been much stronger than Silver and the Miners. You can clearly see that the 150ema on my gold chart has turned up and is supporting price at lows. 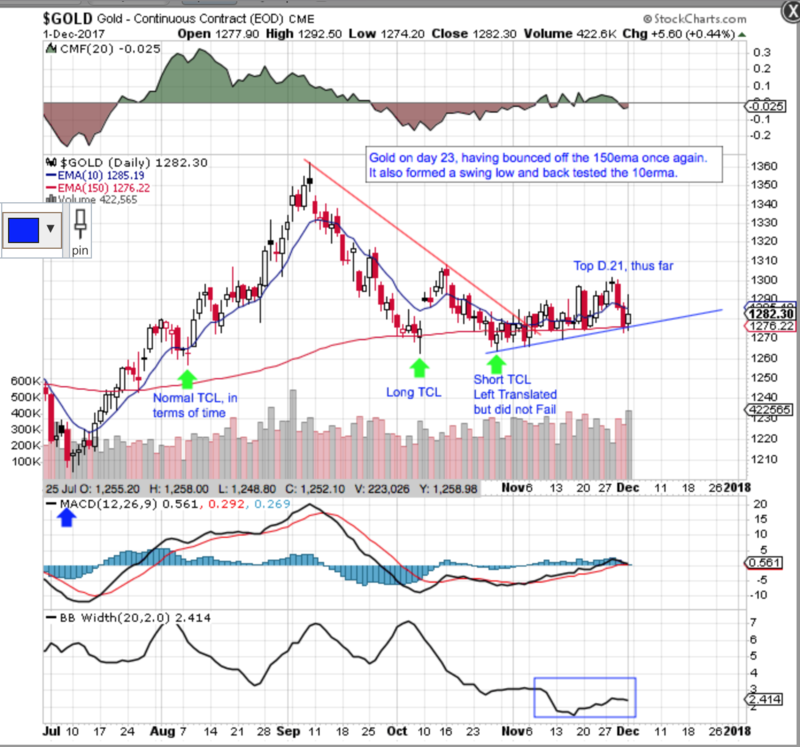 For much of the past month gold has been basing along this key moving average as the Bollinger Bands have become very tight. A big move is likely coming. I have gold on day 23 with a high on day 21, thus far. GDX is on day 19 and both have entered the early part of their timing bands to find their next TCL. While GDX has been weaker it has also found a high on day 17 but after a Failed TC, GDX should be moving lower into an ICL and while that may still happen, I like to see it fighting hard here, resisting the move lower. 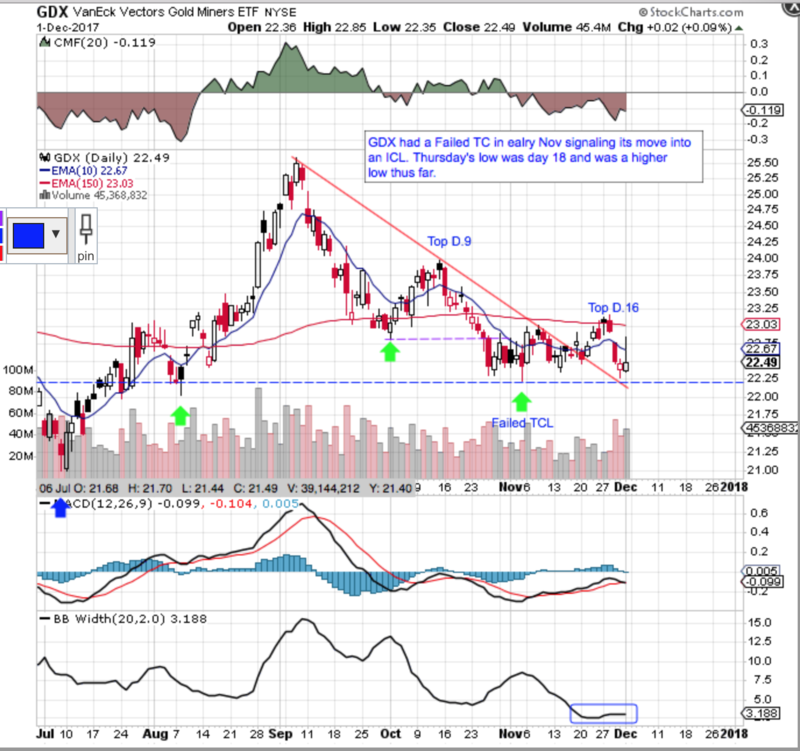 The last GDX TC topped on day 9 and Failed. Now it has made a high on day 17 and entered its normal timing band to find its next TCL/DCL. If it can make a higher low it will confirm that it has left an ICL behind.